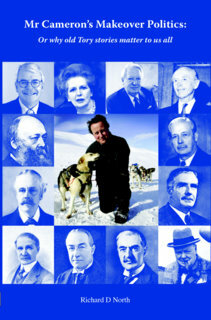 Buy Mr Cameron's Makeover Politics: Why old Tory stories matter to us all now at Amazon. My new book argues that the Cameroons are being a bit timid in ignoring the great Tory back stories which have done the party – and the country – proud in the past. Cover of RDN's book "Mr Cameron's Makeover Politics"
David Cameron has famously “decontaminated” the Nasty Party. But, argues Richard D North, the party has been left curiously featureless. North says: “Bland can’t be the new black. The party of tradition seems to be running from its own history, which is full of intellectual strength and variety. “There’s been a flurry of books on the intellectual history of the Conservatives, and I’ve plundered them to show how rich the Tory back story is. The three great Tory narratives (“Nice”, “Nasty” and “Sensible”), have been conflicted, chameleon and combustible – but above all successful. Unfashionably, Richard North also notes the Tories’ reputation for being “sensible”. They deliver sound government. After rule by the courts of Blair and Brown – from sofa, den and bunker – Mr Cameron’s Makeover Politics ought to “dare to be dull”. This new book follows North’s earlier Mr Blair’s Messiah Politics: What happened when Bambi tried to save the world (SAU, 2006).